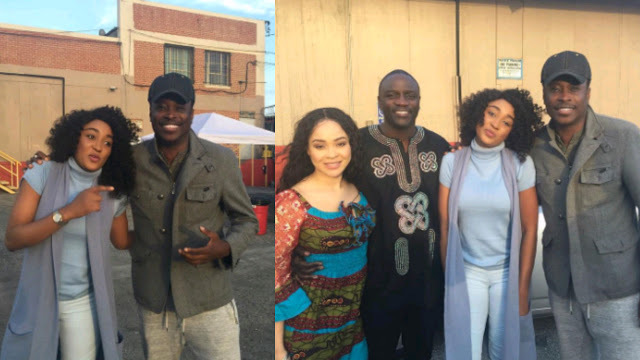 Nigerian movie director, Jeta Amata and his ex-wife, actress Mbong Amata have linked up for a new movie. The couple were married for five years before they separated. According to rumours then, Jeta and Mbong didn't fight, they just decided to let each other go. Jeta met Mbong when she was only 16 years old in Calabar in 2001 during a movie audition. They started dating when she turned 18 two years later. In 2008, they welcomed a daughter, that same year, Jeta married Mbong. "Our beliefs made us 'good' people to each other but our behavior towards each other took it to a whole other level! Out here on set to support one of the best out of the continent of Africa... Director•Jeta•Amata #friendlyexes #makepeacenotwar ✌🏽✌🏽✌🏽#theamericanking #comingsoon #setlife #filmmaker #losangeles #downtownla"